Apple introduced last week the iPad 2. A few weeks ago my friend sold his iPad over craigslist knowing he will buy the new iPad 2. He got 75% of original price. I did not think i want to sell and did not want to be 3 weeks without my iPad, but changed my mind after the keynote. One hour before the keynote gazelle.com did buy the iPad 64GB 3G for $590 which would mean the owner will still get $650 (original $829) for their big iPad 3G selling it private or over eBay. Only hours after the announcement of the new iPad, the price at gazelle.com went down to $550 and now the price is $530 if your iPad is brand new, but don't expect to get the full price, they almost never pay it. 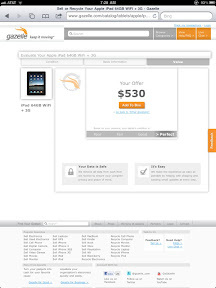 Gazelle.com will even only pay $387 if the iPad has a few scratches on the back. In this case it is better to sell at eBay, because you will still get in average $530. However i decided that I want to save the high eBay costs and posted it on craigslist. $650 64GB 3G with 60 original DVDs. Within minutes a potential buyer emailed me. However the email was suspicious. The buyer said he wants to send with his courier a certified personal check but i have to give him my full address. I decided not to, it looked like scam. Even craigslist is warning for frauds like this. A few hours later somebody asked my through craigslist if I send to Rochester NY. I replied of course but the mailing would be high because of the heavy DVDs. I got an answer it is fine and I shall send my paypal address. I did and I looked every half hour in my paypal account. Did not see anything but was happy to get a descent price for my iPad. 3 hours later i get an email from paypal that I have $750 funds in my account. I almost clicked on the email link to go to my paypal account but i saw that the address (i should send my iPad to) is in Nigeria. 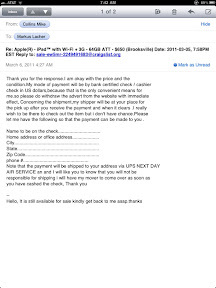 The person did send at the same time an email saying her husband got already an iPad for her and she does not want to disappoint me and therefore I should send the iPad to her sister. Looking longer on the paypal email i recognized that the sender email address is paypal@service.com and not service@paypal.com. My mail program just showed the alias "Paypal Service" but right clicking on the email address gave the real email address. On my iPad it is better, it does not resolve the alias. Outlook makes it really easy for scams. Email was convincing and lucky wise I look always directly in my account and don't click on emails links. But i guess many people don't do and then suddenly their account is compromised because they gave this person their password. 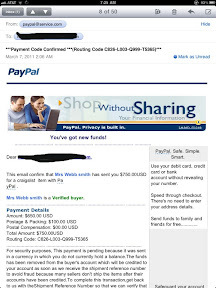 I did send the emails to spoof@paypal.com and should get within 24 hours an answer of their investigating. I bought a lot of things at craigslist but never sold anything. And i will never sell anymore electronics or high end stuff through craigslist the scam is too high. At the end you don't save anything. eBay is still the best way to go, high costs but at least all secure. The only option for me is now Germany. Thanks to Apple. They release of the iPad is in Germany two weeks later. I get right now for my iPad 64GB 3G around $550 with cover at eBay Germany. And the $ is so bad that I actually make almost 80% from my original price. The buyers are willing to pay the shipping which is only $10 without insurance. If you insure the iPad then the buyer has to pay import taxes which does make the deal not attractive. I am a lucky person and a friend of mine is traveling next week to Germany and can take my iPad with him. If you think you want to sell your iPad than hurry. Don't use craigslist or gazelle.com but try to sell it over eBay in countries where the dollar is weak and the iPad 2 does not come out soon. Just go to apple.com and look which country would work for you. It s unbelievable that the iPad is already, after just one week, the most used sold electronic good. Gazelle.com did buy in average 1500 iPads a week. Since the keynote it is 2000 a day. eBay is since then selling more mobile pads than ever. It seems every pad owner (iPad, Xoom, Galaxy) wants to sell their pad to get the new iPad 2. And Apple is smart, because of new form factor all accessories like covers or stands etc will not work anymore with the new iPad and we have to buy all new. At least a few hundred bucks extra to the iPad price. I once switched to Apple because their products kept long a high resale price, Apple did change the form factor only every 3 years. The only thing which changed was processor and memory. I could easily use an Apple device three years and sell it to a good price. Since iPhone and iPad the time is over. Apple releases every 12 months a new device with so much new that nobody wants to pay a high price for used. However the iPhone is still easier to sell to higher price, but because the people can save a lot of money buying a used one without contract and jailbreak it. I know many who buy the iPhone and not have an expensive data plan. There it makes sense to buy to a higher price an used iPhone. A data plan is at least $720 for two years, and who really needs a data plan. Wifi is now almost everywhere. The iPad does come without data plan, therefore nobody wants really to pay more only to get one with 3G. If so then they buy it new. If you consider to buy the iPad 2. Think twice about the 3G model, it will lose more if you want to resell it after twelve months, as long the providers are charging still way to much for data. I am going to get the wifi only model (if i can sell my iPad) by knowing I will never be able to use it as a GPS device. I might end up not to sell my iPad if i don't find a buyer to my conditions. Unfortunately we have already 2 iPads and I might need to wait till September when iPad 2.5 is coming out. Let me know if you want to buy mine with original Apple cover and 60 DVDs for $650.